Female A common and sometimes abundant species occurring throughout England and Scotland including the Isle of Wight, Lundy, Anglesey, Man, the Western Isles and Orkney. Records are much sparser from the west country and it appears to be virtually absent from Wales (Luff, 1998). Generally eurytopic and on the continent a more synanthropic species; over the last century it has increased in abundance in many places in the U.K. although around London the opposite is true (Lindroth, 1974). 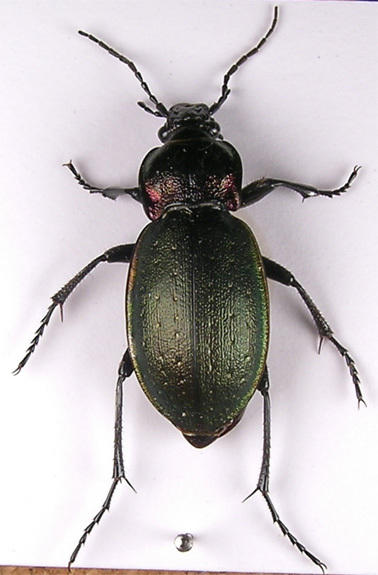 In Ireland it is common in parks and gardens, clearly preferring human activities, and is probably the commonest Carabus, thus replacing the role of C. violaceus in England and Scotland (carabid beetles of Ireland). In Canada, where the species has been introduced from Europe, it is ‘pronouncedly’ synanthropic and restricted to cultivated ground even in city parks and gardens (www.entomology.ualberta.ca). With the exception of the town centre we have found adults throughout our Watford area and also further afield in a wide range of habitats; under debris and around the bases of hedges bordering arable farmland (Watford and Chorleywood, Bucks. ), Cassiobury park on pathways and among leaf litter on shrub beds, under logs in Whippendel wood and on waste ground in Hayes, Middx. We have also found them on two occasions deep within tree stumps where the wood is dry and soft and can be pulled apart by hand although in outward appearance looks healthy; in a birch stump in Whippendell wood (August, 2007) and in a willow stump at Hayes, Middx (summer, 1977). Adults are seldom encountered by general searching but are readily recorded by pitfall trapping, they are flightless and mostly nocturnal in habits although very occasionally active in sunshine e.g. on a hot July afternoon in 2009 a male was seen running on a pathway in cassiobury park, this unfortunate insect was trodden on by a less than intelligent passer by! Adults spend the day under loose bark or among deep plant litter, emerging at night to forage over a wide area, usually on grass or among litter but they also ascend mossy tree trunks. Prey includes slugs and snails, woodlice, millipedes and centipedes. Adults are active from early spring, breed in the summer, and persist into the autumn. 22-26mm. A large and brightly coloured species although a black form has been recorded from Dartmoor (Lindroth), very distinctive and soon becomes familiar even in the field. Head black with vertex and clypeus wrinkled, with a strong, oblique ridge from above the front margin of each eye to above the antennal insertions. Eyes strongly convex and relatively small. Mandibles robust and produced forward. Antennae black. Palps black with testaceous tips; penultimate segment of labial palps with two (rarely an extra one on one side) setae on inner surface. Pronotum black with lateral, and often basal, margins bright metallic bronze to purple. Transverse (5:8) with hind angles produced backwards, lateral margins explanate; broadening towards base. Surface finely wrinkled on disc becoming strongly wrinkled or obscurely granulate and punctured towards lateral and basal margins. Basal margin not bordered between produced hind angles. Elytra broad and convex, metallic overall; generally green with side margins vivid green to bronze or purple, without pubescence. Each with three rows of small fovea which are golden metallic at the centre (x10). Sculpture consists of numerous lines of irregular longitudinal granules which appear as lines of overlapping scales in some lights, without any ridges or sculpture appearing larger than any others. Legs black and relatively slender. Each tibia with two long spurs at apex. Front tibia smooth along inner edge i.e. without a notch. Segments 1-3 of fore tarsi dilated in male.